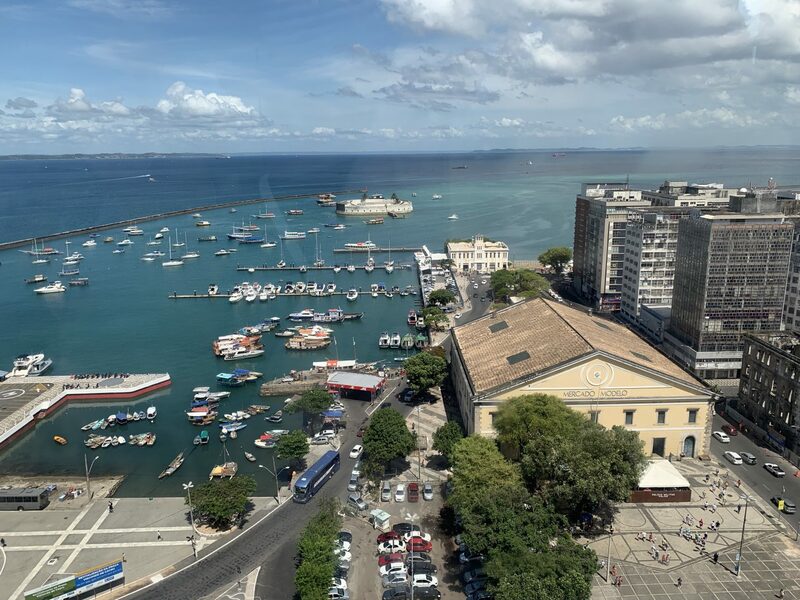 After several days at sea, today we made land at Salvador Da Bahia, Brazil. 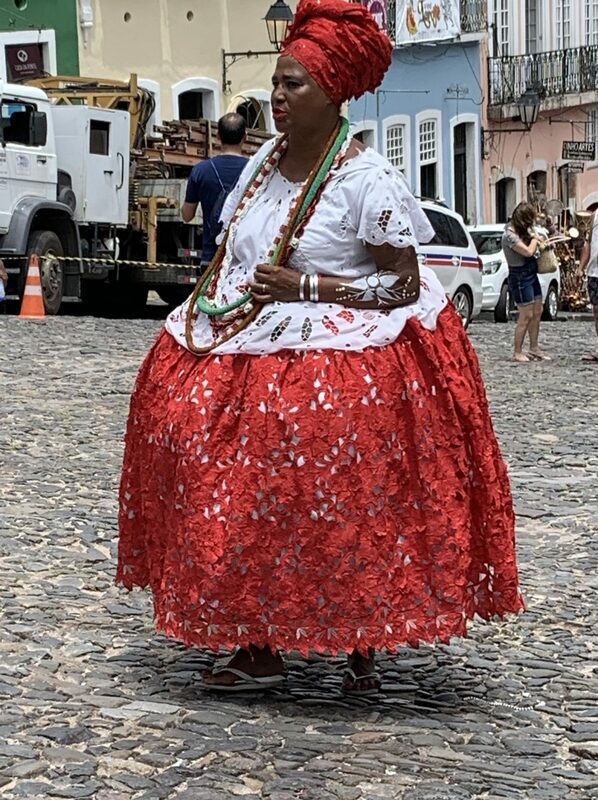 (Bahia is a state.) 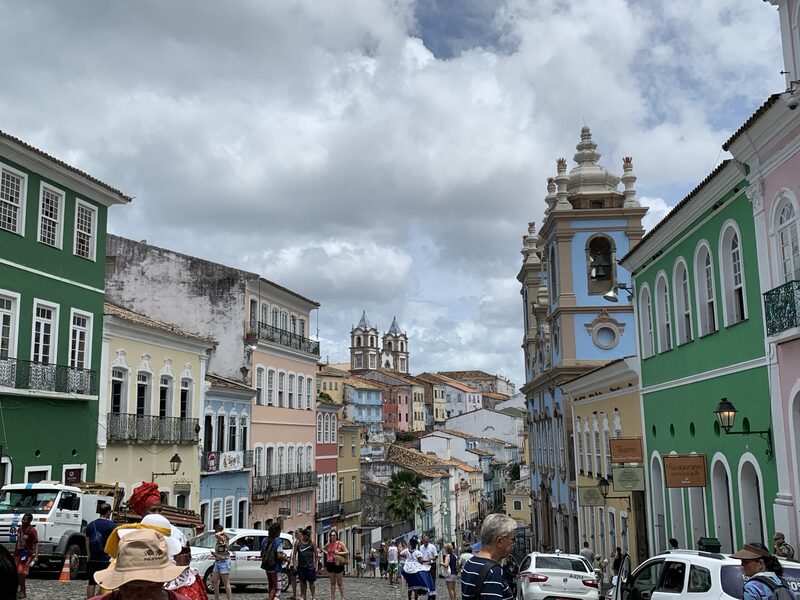 This city was founded in 1549 as the first capital of Brazil and remained the capital until 1763. The city was originally established on a high escarpment overlooking the Bay of All Saints, the largest bay in Brazil. The lower part of the city was built up later. 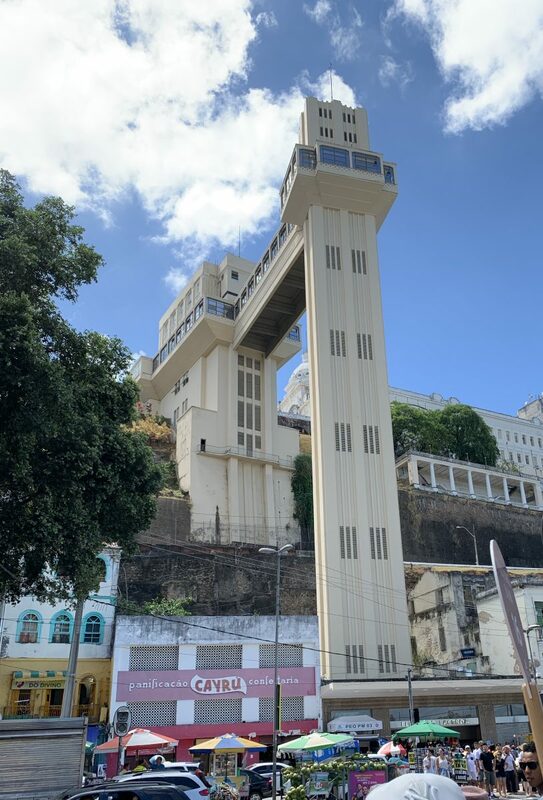 The upper and lower parts of the city are connected by the levador Lacerda, first built as a cargo elevator in 1873. At the top of the elevator we got a good view of the Bay of All Saints. 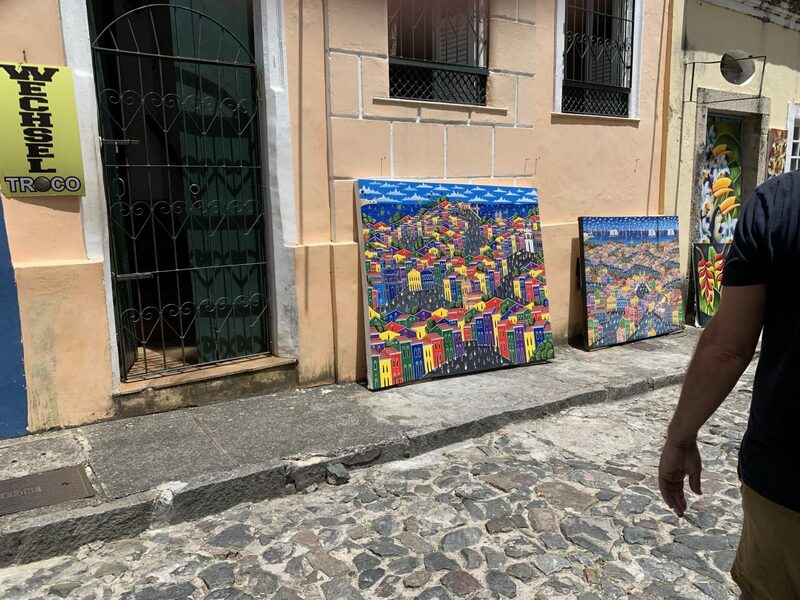 Our tour focused on the Upper Town, the colonial area that was named a UNESCO World Heritage Site 1985. The area continues to undergo restoration and preservation. Many of the buildings now sport pastel facades reminiscent of their colonial origin. 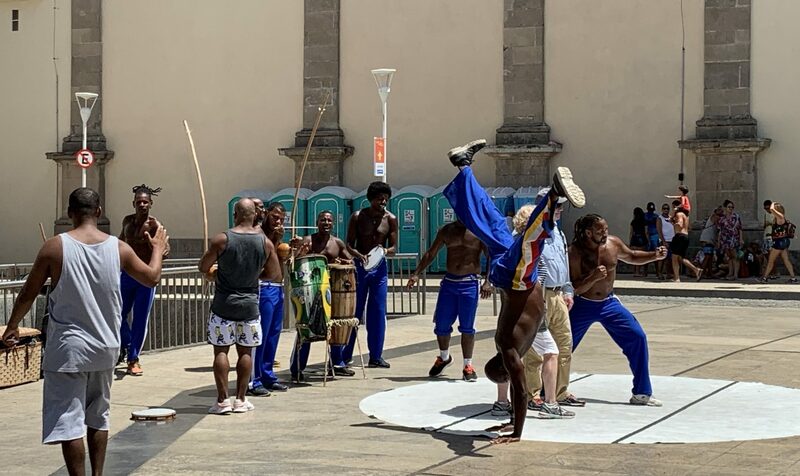 Salvador was the first slave port in the Americas, and it is estimated that over the years about five million Africans were brought over to work in the sugarcane fields and in the diamond and gold mines. 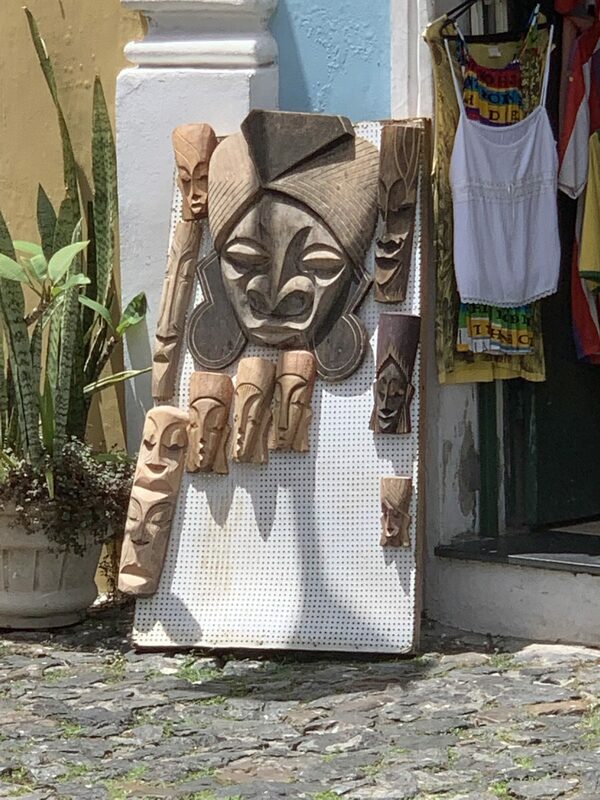 As a result, Salvador has developed a religion and a culture that combines elements of native indigenous people, African slaves, and Portuguese traditions. The colorful local incorporates many African images. Today the city contains more than 300 churches, but it also annually celebrates a religious festival in which many people, some dressed in African-inspired costumes, march four miles in procession to one of the churches. We visited on the day before the festival, so we got to see some of the costumes without having to experience the huge festival crowd. The city still felt crowded to a lot of us. When someone asked our guide if the crowd was normal for Salvador, he said that the city was more crowded than usual for two reasons: (1) three cruise ships were in port that day, with a total of about 9,000 tourists; and (2) many people from outlying areas had traveled to the city for the annual festival. The chief resources of Bahia are fruits, vegetables, cocoa, beef (there are more cows than people in Brazil), and oil. 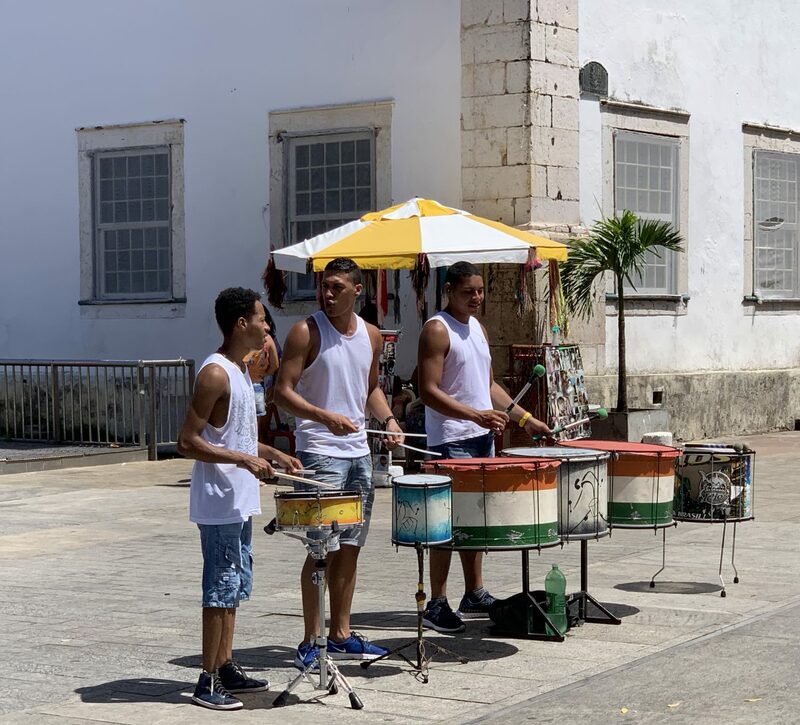 Our guide emphasized that Salvador is a city that loves music. He told us that their Carnival lasts a full week—five official days plus two extra days. We saw a lot of evidence of the love of music in the number of bands and dancers we saw. One form of local dance is an amalgamation of dance and an African defensive form of what we would now call martial arts. All material on these pages is © as indicated and may not be reused in any format without prior written permission. Retreading for Retirement Blog at WordPress.com.